The good news for football fans in Wales is that they are generally paying no more than last season to support their team and in some cases less. The annual BBC Price of Football study, the largest of its type in Europe, looked at costs at 227 clubs in 13 leagues across the UK and Europe. Swansea City declined to take part in this study, but Cardiff City, Newport County and Wrexham are included. For the first time the Welsh Premier League is also included in the figures. Just under 30% of tickets surveyed were more expensive this season. 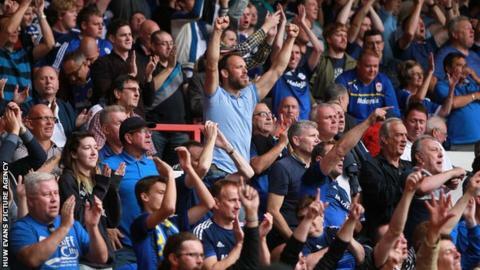 In the Championship, Cardiff City's cheapest season ticket has risen from £329 to £345, but the most expensive has reduced from £689 to £539, while the premium match-day ticket is down from £40 to £32. The cheapest entry for one-off matches at Cardiff City Stadium remains £18, although adult shirts are up 15.5% to £45. Pies remain £3.40 and tea is up 10p to £1.90. Reading have the cheapest season ticket in the division at £135, while you can pay as much as £839 at Fulham. You can pick up a match-day ticket for as little as £10 at Reading and Derby, while if you want to splash out you can pay up to £52 at Sheffield Wednesday. Birmingham City have the most expensive tea, not just in the Championship but in the whole study, at £2.90 - although their pies are just £2.20. The upper crust award is held by Brighton at £4.10 per pie. Newport County's prices have shown minimal rises except for your half-time beverage, which jumps 50% to £1.50. The cheapest category tickets remain unchanged at £17 for matches and £250 for the season, although top prices and shirts have risen slightly to £410 and £37.50 respectively. The Exiles' prices compare favourably with their League Two rivals, with match tickets ranging from £15-28 and season passes from £180-£540, while a Barnet fan will pay £49.90 for his shirt. National League side Wrexham are one of the minority of clubs whose season tickets have risen this season, with the options jumping from £229-259 to £241-359. Eastleigh are the cheapest in the division at £120-180, while you would pay up to £414 as a Cheltenham fan. But match-day tickets at the Racecourse Ground remain at £15-19, adult shirts at £39.99, and pies and tea at £2.60 and £1.80. The Welsh Premier League is included in the study for the first time this season and it is clear that Airbus UK Broughton fans get quite a deal with season tickets at £36-£54. The most expensive in the division is the £111 at Bangor City, while match-day tickets across the 12 clubs in the division are £6-£8. Tea is a reasonable 80p-£1, pies can be had for £1.50-2.50, while an adult shirt can be had for as little as £25 - if you are a Port Talbot fan. Aberystwyth Town charge £43.99 for wearing your team colours, more than the £40 Premier League newcomers Bournemouth ask for their shirts.